Is Apple Killing Linux on the Desktop? "The main problem with the previous Mac Pro models and in fact with the first Xeon 5xxx platform was the low performance due to the bottleneck of the memory bandwidth. "It seems that the new Mac Pro do not suffer from this early adoption defect anymore, as illustrated by a benchmark assay run by Primate Labs to compare a new Mac Pro 8 cores 2.8 GHz with the previous Mac Pro 8 cores 3.0 GHz." "This initial CPU crunch test pits the 'Apr 2007' 8-core 3 GHz 'Clovertown' Mac Pro against the 'Jan 2008' 8-core 3.2 GHz 'Harpertown' Mac Pro. Though the core frequency gain of the 'Harpertown' is only 6.7%, the speed advantage in the tests ranged from 12% to 24%. That shows what a faster frontside bus and faster memory bus brings to the party." "Earlier this week Apple released updated Mac Pros that use Intel's new Penryn processors. Also new is the fact that the standard Mac Pro configuration now comes with eight (instead of four) cores. "Of course, what I've been wondering (as I sit here and think about getting a new Mac Pro) is how does the new standard eight-core Mac Pro perform compare to the old high-end Mac Pro? I've gathered Geekbench 2 results for both Mac Pros to find out." "In the end, however, I'd still contend that more OS X sales are good for Linux . . . not bad. It gets people used to not using Windows. It introduces them to a UNIX-based OS. It opens doors that would be hard for Linux to open. Once the Windows monopoly is broken, it will be easy for all other operating systems to get a fair look. I welcome that day." Link: Is Apple Killing Linux on the Desktop? PR: Newer Technology, Inc. (NewerTech), has announced its new USB 2.0 Universal Drive Adapter. 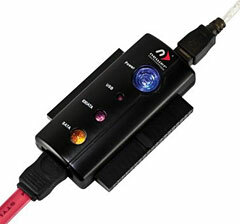 The NewerTech USB 2.0 Universal Drive Adapter now features connection status LEDs for easy confirmation when connecting to a USB 1.1/2.0 equipped computer and an IDE/ATA or SATA drive. A Macworld Expo 2007 bestseller, the NewerTech USB 2.0 Universal Drive Adapter is a complete solution that allows any 2.5", 3.5", or 5.25" hard drive or optical drive (standard IDE/ATA/ATAPI 40 pin or Serial-ATA) to be connected via USB to any computer for file transfer after the upgrade of an internal hard drive; for backing-up and storing file archives; and for data access from stored backup drives with Plug & Play ease. With digital audio and photo files growing in size and becoming a part of daily life, consumers need larger hard drives to store these files. After they upgrade to a larger drive, the NewerTech USB 2.0 Universal Drive Adapter enables consumers to transfer data between drives and gives the old drive a second life as an external storage solution. Truly universal, the USB 2.0 Universal Drive Adapter has been tested to work with all hard drive brands, including Maxtor, Seagate, IBM, Hitachi, Samsung, Western Digital, and Fujitsu; optical drive brands, including LG, Lite-On, Panasonic, Pioneer, Plextor, Sony, Teac, and Toshiba; and removable media drives, such as Iomega Zip. The adapter provides a USB 2.0 transfer speed of up to 480 Mbps and is also backwards compatible with USB 1.1. "A Can't Live Without Accessory"
Called "the Swiss army knife of disk connectivity," the NewerTech USB 2.0 Universal Drive Adapter has been praised as "A can't live without accessory" by Mobile Technology News, and "An ultimate technology key" by Creative Mac News. The Chicago Sun-Times calls the NewerTech USB 2.0 Universal Drive Adapter "Simple to use . . . Drag and drop files at will." Priced at $29.95, the NewerTech USB 2.0 Universal Drive Adapter comes with everything needed for immediate operation: USB 2.0 to IDE adapter cable, 2.5Ëÿ to 3.5Ëÿ adapter, power adapter, LED connection indicators, USB 1.1 backward compatibility, and a full one year NewerTech warranty. It is compatible with Mac OS 9.2 or higher including Mac OS X, Linux 2.4.X, and Microsoft Windows 2000/XP (no driver required). PR: VictorSystems hardens Apple Mac mini computer system to withstand harshest environments and use. VictorSystems, has released its second system based upon the Apple Mac mini Computer. The company is focusing on providing ruggedized commercial and industrial products for demanding Mil/Aero applications. 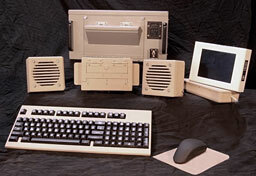 This system further refines the ruggedized Mac mini developed in the companies' first system. It is available for viewing at Macworld 2008, in kiosk W-4454. VictorSystems provides manufacturing and engineering services for the Mil/Aero industry, with emphasis upon ruggedizing commercial and industrial electronic systems. Apple has posted the developer note for the new eight-core Xeon Mac Pro desktops. This Developer Note describes the Mac Pro computer introduced in January 2008. It includes information about distinguishing features of the computer, including components on the main logic board: the microprocessors, the North Bridge memory controller, the South Bridge I/O controller, and the buses that connect them to each other and to the I/O interfaces. The computer comes with Mac OS X version 10.5.1 or later installed. The quad-core Mac Pro consists of one Quad-Core Intel Xeon "Harpertown" 5400 Series processor. The 8-core Mac Pro consists of two Quad-Core Intel Xeon "Harpertown" 5400 Series processors. The value of the computer model machine identifier string is MacPro3,1.